Social Media gets a lot of press as the marketing channel of choice. If you think about it, this makes perfect sense. People from all ages, backgrounds and ethnicities spend many hours of their week perusing the feeds. News and information can spread quickly, across a broad range of audiences, and even the globe. Social media has even facilitated entire civil movements. The uses are endless. But in this fast-paced online environment, it seems like social media mores are changing every day. Should you be on Facebook, Twitter, Instagram, Pinterest, Google+ and every other platform known to man? Where are your customers most likely to be? And how can you go about reaching them? These are all very pertinent questions, and many small business owners are asking the same thing. Do You Know How to Make Social Work for Your Business? Plus, did you know social media is the new “word of mouth”? It’s true. People are looking to social media to learn more about products, review companies, and help decide whether or not they should make a particular purchase. In fact, Forbes estimated 31% of all referral traffic came from social media, and that the channel has experienced exponential growth year-over-year. In fact, it has drawn almost even with search engines as a traffic driver! Think about it like this: if your company is nowhere to be found, you might not even make it into the consideration set. Yikes! 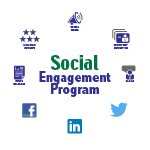 These reasons are precisely why we created our Social Media Packaged Program. So many of our clients were feeling confused, overwhelmed, and completely lost. So we took our many years of experience, combined it with cutting-edge tactics and industry knowledge, and then distilled it all down into an easy-to-follow roadmap for small business. You can feel confident knowing you’re following a tried-and-true recipe for social media marketing success and bask in the excitement as you watch your customer engagement and leads soar. At the end of the day, we want all of our clients to be happy. On the off-chance you aren't finding the program helpful and valuable, you will have 30 days from the program start to request a full refund of all program fees paid to date. That’s 30 days to try it out, risk-free. No fuss. No hassle. No downside. Don’t Wait Any Longer, Call for Marketing Help Now. Let’s get started, today! Call 770-893-2443, and learn more about how the MarketBlazer Social Media Package can help you.